Our soggy, clammy climb over Furka Pass ended with a long, slow descent into a valley with the ski town of Andermatt nestled at the far end. Our diminishing regard for the cycling books sunk even lower when we arrived in town. It recommended 4 hotels in town, all with starting prices over $120. The display board outside the closed tourist info office revealed that only about a fourth of the 30 or so lodging options in town were in that price range. We had to wonder if these were purchased advertising slots in this book rather than 'insider tips' we expect in an expensive guide book. The Germany-based Bikeline brand of cycling route books always seemed like they were by cyclists for cyclists. These Swiss bike map books seemed to have a very different agenda. Bill's best guess about their useless grade indicators is that they were reporting the average grade over a fairly long distance instead of reflecting the actual grades on specific segments of the road. Bike race loot: 3 backpacks & 2 cones. Though we vowed to keep costs down while being in Switzerland by minimizing lay-over days, we did spend an extra day in a very comfortable hotel in Andermatt. The clouds that had obscured the views over Furka Pass still hung in the valleys and we didn't want to sacrifice more mountain top panoramas to the heavy weather by heading out the next morning. Also, the Tour de Swiss was rolling through town and up our climb so we opted to sit on the roadside and watch the racers go by. It wasn't very exciting as we knew none of the competitors and couldn't get any information about the race itself. But for us the high point of the day was being the surprised recipients of 3 Swiss Postal backpacks that the co-sponsor was tossing out to the few spectators on our stretch of road. 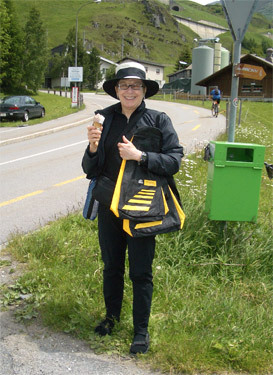 The free ice cream treats gave us indigestion but the backpacks were a treasure. The next pass out of Andermatt, Oberalppass, was a breeze compared with Furka. It wasn't as high and the steep stuff was at the beginning not the end, making it much easier. The views going up and down weren't as grand as Furka but at least the weather had cleared enough that we saw what there was to see. Our early National Bike Route experience with our expensive Swiss "Veloland Schweiz" route books was on Route #1 and we kept hoping they would get better. But unfortunately, our experience was no better on Routes #2 and #6. One day we looked over to see the Bike Route #2 making a blind, right angled-turn off of a highway sidewalk up a steep grade on dirt and gravel. Going up or down that rough path so close to truck-route traffic looked like an accident waiting to happen. Like on Route #1 when we decided that the truck traffic was less dangerous than the bike route, we wondered what sadist had charted these routes. We did ride Route #1's gravel path the last 3 miles into a town along a river where it looked too boxed in to get too crazy and it was fine. But undesignated 15% grades continued to appeared on the official routes and we gave up expecting the route books to contribute much to daily planning. The next climb over Albula Pass had to be broken in several days as the severe up and down grades which weren't indicated brought us to our knees (especially in the middle of the heat wave) --with the first day's elevation gain being more than double that expected. That was even after Bill kept us on the main road whenever the official route ventured off asphalt. The fluff the roads were built on. I will say one route did take us to some dazzling sights of thousand foot tall heaps of morainal till left by the ancient glaciers. The many views of the severely eroded slopes were captivating and we stopped several times to pick at the grit on the road bank or at short tunnel entrances. 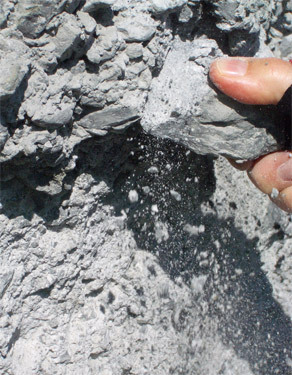 It was distressingly easy to flick away the 'rock' and left us wondering how they built roads through the so easily sloughed material. The beautiful Saturday weather brought out legions of cyclists steeling their resolve to climb these steep roads. We were going the relatively easier way, as were the few other loaded. cyclotourists. On this warm but stunning day for cycling, only 1 Swiss cyclist would chat with us. We spoke with several German pairs of cyclists, but the Swiss cyclists proved to be as tight-lipped as the other Swiss we encountered. A couple of young men commented on our "Barcelona to Istanbul" sign though none lingered to talk. Our route took us to the base of a road to Splügen Pass, our first high pass in Europe that we did in 2001. It was hard not to give it a second chance as we have such fond memories of that big day. I noticed the Michelin Green Guide described it as "one of the boldest and most spectacular in the Alps." We reminisced about Ullie, the retired German drill sergeant who coaxed us up the more difficult Italian side in 1 day rather than the 2 that Bill had planned. He spoke little English but the twinkle in his eye indicated that he taken us on as a project even to the point of having a farmer and a motor touring couple applaud us along the way. Every time we climb steep grades we recall that it was on the difficult climbs of Splügen that we learned to use the banked curves of switchbacks to ease our start after rest stops. We stopped short of our planned destination on Day 2 up Albula Pass, turning our 3 day assault into 4. We were frazzled: the extra gain of the up and down road had us out in the heat too, too long. Dunking our heads, feet and hands in the nearby water trough didn't compete with the imagined relief of the unexpected hotel with a shady garden.. The heat was unrelenting and even at 4500' above sea level the temperature had soared into the 90's before noon. The third day we struggled under the summer sun on the grades that hovered around both sides of 10% and bailed out as dictated by our revised plan after little more than 4 miles. It seemed incredibly silly to only ride 4 miles but it was our best option after previously surrendering to the heat and stopping early. Amazingly, in those 4 miles we climbed another 1200' up the height of the the mountain. Bergün was the last village with a grocery store and lodging before topping the pass and we knew that the 3,400' climb that would take us to almost 7600' would be enough challenge in the heat for one day. Even steeper grades would be waiting for us but we hoped that at some point the increasing elevation would take the sizzle out of the sun. We waited our turn to use the road. Our Bergün starting point at 4800' was already 55 degrees by 7:30 in the morning. Luckily, our road was on the east side of the ravine and we rode for over an hour in the shade. As we crawled our way up the steep grades the temperature actually dropped into the high 40's. I was in heaven. I shed my long sleeved sun shirt and rode in my Cool-Max T-shirt, which allowed the sweat to evaporate instead of pool on my flesh. Bill was alarmed as I kept imprudently darting ahead, reveling in the welcome coolness we hadn't felt for days. Of course, it wasn't long until the sun warmed the air even in the shade and we were feeling the unwelcome effects of the direct sunlight. But our early start saved us as we were able to cover more miles per hour that first hour as our rest stops didn't have to be so long. A minute or 2 stop was enough to catch our breath and then we'd head out again. On the previous days, even in the first hour we were taking 10 minute breaks to drop our body temperatures. A couple of minutes helped, but the effort of pedaling on 10+% grades kicked out so much heat from the inside that longer breaks were needed to more thoroughly cool down when the air was hot. The terrain to Albula Pass was so steep in this area that the train takes a couple of switchbacks up one slope, does a complete loop in a tunnel to grind its way higher and a mile later takes a spin through 2 circular tunnels. The tunnels were stacked one on top of the other as a way to gain more altitude at more moderate grades. The train then disappears into a long tunnel to elude the last 1700' up to the pass. 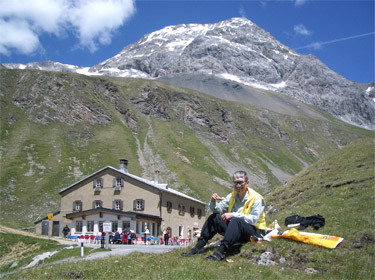 Roadside lunch at Albula Pass. Albula Pass peaked at 7588' with the "by the map" altitude gain measured from the low point being about 5400'. The bug-a-boo with this pass was all of the up and down along the way. We accumulated 8,800' of gain to go up 5400'. But as usual, the hard climb up the high pass delivered spectacular views. We perched on a knoll above the road for our picnic lunch and savored the views in every direction--our favorite Alpine pastime. It was so hot that we didn't need to bundle up for the descent--a first. We'd put on vests for a little wind protection while we lunched at the summit and they were all we needed for 'descent wear.' Part way down we took those off as the heat of the valley rolled up to meet us. Our last Swiss Pass, Ofen Pass near the Italian border, only took us a little above the 7,000' level. We grumbled as the expected 2200' gain turned into over 3400' with an unexpected big downhill section in the middle of the climb. But with "Ofen" being German for "oven" we were surprised not to bake on this climb as we had on Albula. We reached the summit before noon and didn't suffer under oppressive heat as we had the previous days. But by afternoon, even the high valley had heated up. We struggled up the little hills in our destination town that was still over 3000' above sea level under the heaviness of air temperatures in the mid-90's. As we labored to make the last bit of distance for the day, we resolved to exchange our normally leisurely starts for being out the door by 7:30 in the morning and to aim for hanging it up for the day by noon. Our descent from Ofen Pass deposited us back in Italy where we looked forward to indulging in Alp's vistas for several more weeks at the more comfortable Italian prices. In the 2 weeks since we left Stresa, Italy and headed into the Swiss Alps we had done almost 27,000' in elevation gain. Bill thought we had been "doggin' it" because of our numerous rest days but that tabulation was a good reminder as to why we had been compelled to take so many days off. We found the Swiss to be quite reserved and weren't able to talk with many. In Andermatt our hotel host and a well traveled young man at the bike shop were chattier and interestingly, both made disparaging references to "Old Switzerland." The young man also mentioned the discrimination he experienced living in this town because though he was Swiss he was from another region and had the wrong accent. Their comments made our 'outsider' experience make more sense. I did keep wondering that given that the Swiss hadn't been scarred during the World Wars or by civil war, why they felt a need to be so reserved. It seemed like their less destructive recent history would have them positively effervescent. Perhaps its is their obsession with self defense that feeds their withdrawing demeanor. Our Lonely Planet guidebook offered that military service or the equivalent is required of all Swiss men and almost daily we saw men in uniform and their vehicles around, though usually without weapons in hand. The guide book also commented that they have vast stockpiles of weapons stashed in the mountains. We frequently saw signposts pointing to the "Arsenal" and daily saw stainless steel or steel doors in concrete walls, either in tunnels or built into rock faces or hillsides. Other doors on rock faces were tinted and textured to blend in with the surrounding rock and one had an access ladder bolted to the rock near the entrance with a connecting ladder locked up off to the side. A few of these were identified as military property but we wondered if the others were the squirreled away provisions we'd read about. It was a bit chilling to have those daily reminders of their military readiness, even out on the mountain roads. Apparently Switzerland has shelters to house almost their entire population in case of nuclear war. We got more value for our lodging dollar after we traversed Furka Pass: the prices didn't go down, but the quality went up. It was low season until school let out on June 24 and we were able to get nicer rooms with private bathrooms for around $80--the price that had us a step above dormitory accommodations initially. However, as we moved into the smaller villages of the higher mountains, the prices in the grocery stores skyrocketed. Motorists could easily drive the 10 or 15 miles for better prices but the walkers and bikers were stuck paying double for food over the normally doubled or tripled price of groceries in Switzerland. As the prices skyrocketed, the size of the produce got smaller and smaller. The dainty Braeburn apples weighed 1/3 of what they usually did and instead of heads of cauliflower weighing several pounds and being sold by the piece, here the little guys weighed a fraction of a pound and we paid by the gram. One of our last stops in Switzerland was going to be St Moritz but we bailed after reading that there is a heavy slant on the "ritz" part. Switzerland had been expensive enough that we didn't need to go to an extravagantly expensive place to people watch and take a cable car ride. The high mountain passes tired our bodies with their steep grades while delighting our minds with stunning panoramas; the equally extreme prices for absolutely everything strained our pocket books and rattled our confidence; but the repeating, pleasant surroundings of Alpine Switzerland provided a soothing source of continuity to our days. Switzerland's infrastructure is consistently well maintained and the standard of living in the mountains seems to be universally high, both helping to move the harsher realities of living in much of the world into the background. There was little litter on the ground and the roads were almost always swept free of rocks or broken glass. We had little access to TV news or the internet, making the dissociation from the outside world even greater. Instead of world politics and then next domestic and international crisis, our attention was drawn to compact villages and slow moving, fire-engine-red trains. If being in the village or hopping a train wasn't good enough, each village had several different signposts giving walking times to at least a dozen destinations and there likely would be a few benches for resting along your way. The self-contained quality of the Swiss mountain lifestyle was emphasized by almost every little village having a grocery store and a post office, unlike many countries we've been in. And it didn't have to be a very big village to have a sportswear store to support outdoor activities but only the biggest town we were in, Brig, had a bookstore. Even at our slow pace, we spotted almost neighborhood-sized hydroelectric projects daily. I assumed that hydro provided almost all of their power but read that over 40% comes from nuclear generation. We were late to learn that the wooden or stone troughs with free flowing water were plumbed with the same potable water serving the homes. In the villages, traditional mountain architecture with thick walls and deeply recessed windows was the norm, both in new and old buildings. Untreated wood or stucco was the standard look, with the predominant finish varying with the particular valley. Painted wooden shutters and a bit of decorative wood or iron work were common. Some areas were reviving distinctive geometric designs on the exteriors. 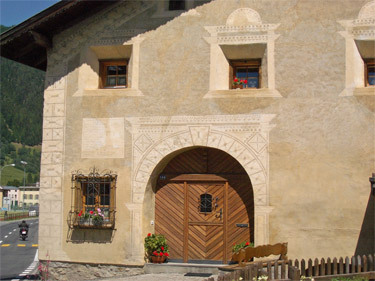 Though in general we didn't find the Swiss houses as pristinely maintained as those in the eastern part of the Alps. In Switzerland, many of the wood-planked houses looked in need of a coat of stain and more of the out buildings were a rough assemblage of scrap material instead of being similar to the standard of the home. The grounds around the homes weren't as neatly kept as in the Austrian Alps. We were never out of sight of the evidence of logging, whether it was the distinctive look of clear-cut areas in various stages of regeneration on the steep slopes, trimmed logs filling all the cars on a short train, or a small woodworking factory on a back street of many little villages. 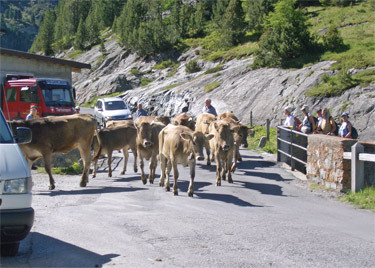 Like wood production, the sounds, smells and sight of cows were also daily backdrops to our Swiss experience. And somewhere around the 5000' level the number of ski lifts escalated and ski runs cutting through the European larches, spruces, and pines were evident even when we couldn't spot the lifts serving them. Who is that masked man?. The Swiss commitment to the environment showed in subtle ways. Some towns, like Zermatt, are motor vehicle free except for those powered by electricity. Recycling and litter bins were prominent and we didn't see the careless dumping or burning that we see elsewhere. The distinctive flowering "meadow mix" used in the fields that came right up to many a doorstep made me wonder if the Swiss were intentionally using multi-flowered blends to support insect diversity before being cut for fodder. (Whatever the motive, the elaborate mix did ensure that there was always something to trigger Bill's hay fever.) Our noses were also insulted in Switzerland by all the cigarette, cigar and pipe smoke after being in Italy with the Italians new no-smoking-in-enclosed-public-places law. 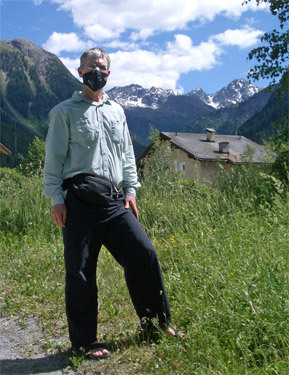 In Switzerland we gagged on a staff member's pipe smoke filling a commercial area and found ourselves rushing past smoky areas like we hadn't done for months. We spotted cars on the road in Switzerland that we don't usually see. Being former owners of a pair of Subaru's, it was fun seeing a few of them out and about. But more surprising were the Cameros, Corvettes and Lotus's making a showing in Alpine villages. But even having a budget car in Switzerland is expensive as almost every place wide enough to park a car was posted as private parking or was a pay-to-park place, even in the smallest of villages. Repeatedly when we'd pull off the road for a breather we'd be face-to-face with a sign informing us about the parking criteria. Parking at restaurants and larger grocery stores was free, but of course for a limited time. Overnight bike parking however was always free, even in this lavishly expensive country. The ubiquitous ski rooms were often the overnight resting places for our steeds though they occasionally spent the night in a garage. Everyplace we inquired about lodging had a place for the bikes. Though we found the Swiss National Bike Routes largely unsuitable for our loaded touring, Switzerland is a bike friendly country. There are bike lanes, bike routes, parking areas for bikes, many bike shops, and lots of people on bikes. Bikes can be put on some of the trains and in the summer they can be hung on the back end of some buses. Seeing unlocked commuter bikes outside restaurants, businesses, and homes was a pleasant commentary on the ease of owning a bike in eastern Switzerland. And we found that the motorists rarely competed with the cyclists and were usually very obliging when it came to sharing the road. Unexpectedly, we found ourselves comparing Switzerland with Scotland. Both delivered memorable experiences of riding in the rain, the sighting of many black and white Border collies, many views of lush glacier carved valleys, and isolated lifestyles. And both had long narrow golf courses tucked into the most unexpected places. 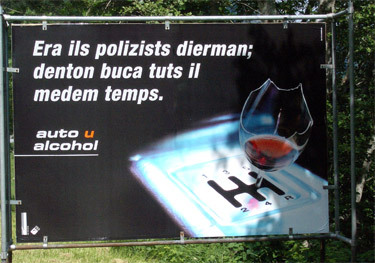 The billboard message was clear but the language wasn't. Like in Scotland, Switzerland was linguistically challenging. Bill was flummoxed by the local German dialect that the Swiss use. They write the High German that he knows but they speak a more French sounding version of German. He was quite surprised that they also didn't understand his German which has served him well in many other countries. We were taken aback by the Romansch language derived from Latin that looked like an odd blend of Italian, French and German. It is primarily a spoken and not written language with many dialects around the small country. Isolated mountain living allowed all of these linguistic variations to persist and has become a source of regional pride. And at last, I found the answer to the burning question as to why "CH" is the abbreviation for their country on license plates and on the internet when all of their various languages begin the word for Switzerland with an "S." "CH" is the abbreviation for the Latin phrase "Confoederatio Helvetica," the 1291 alliance of several regions that took a stand for independence from the Holy Roman Empire. Our 2 week tour of Switzerland began with the dramatic climb up Simplon Pass on its border with Italy to Brig in south central Switzerland. We rode up and down in the rain and record heat and exited through their only national park and over Ofen pass at almost the eastern most point of the country. This region of Switzerland is dominated by the Alps and like in Iceland, people come for the outdoor activities not cultural pinnacles. We are in Canakkale, Turkey (a city of 60,000) southwest of Istanbul on the Dardanelles. We've signed up for guided tours to the WWI battlefields at Gallipoli and the ancient city of Troy and then we'll continue on to Istanbul. While here we'll do more research for getting ourselves to Australia and New Zealand though the 25-30 hour travel time has us thinking twice about the journey..